I was going to write a post about stenciling letters onto burlap, and creating a pillow from it. (And I promise to get on that soon. Really, I will.) But you see... I have a new man in my life. Yes, I know. Adrain goes out of town, and I find someone new. It's a problem. But he's so adorable, I couldn't help it. He's rather short, at least a foot shorter than I am, which is quite refreshing to be honest. It's nice to hug a man without getting my nose crushed against his stomach. Er, something like that. Plus, this guy has big plans to defend me against the British Empire. Should they invade and attack. Not that they will... I'm just saying... You never know. His name is George. George Washington. Ever heard of him? He's a little different than I thought he'd be. He thinks his back scratcher is a sword. And he wears a hand towel on his head....but whatever. To each, his own, you know? No such thing as a perfect man. Of course, I don't know how long this relationship can last, because he likes wearing my clothes. Kind of reminds me of a boyfriend I once had, but that's another story for um... never. I love the serious pose. Very noble. REvolutionary War is one of my favorite historical times. Oh, this is so cute. As a US History teacher myself, I would give him an A+. That had to take some time. That's devotion and getting into character if I ever saw it. Awwww... I can totally see your problem. He is adorable. Forget about stencilling letters. 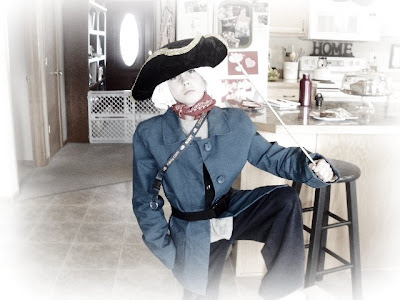 Bask in the George Washingtonness that is your child. adorable - did he put that get-up together himself? Our sons would get along so well! I am followed around during the day by handosme little soldiers as well! I love the how he put his costume together. He looks extra cute- even with a towel on his head. Love the hand towel wig, and seriously - thanks for the morning chuckle. Adorable! I love that period of history and reading stuff set in the late 1700-1800s. Me and Jane Austen are BFFs. I just love that JJ of yours...Towel and all! You have such a creative mind... that towel looks perfect! Too cute! what a cutie! did you take a picture of me on your widget? Did you??? George never looked so good. So serious! And so cute! I love the towel wig! Adorable! And a towel for a wig? Ingenius. He actually looks pretty good. What an imagination! Or was it YOUR imagination that got him dressed like that? Oh Mr. JJ. I miss him. Maybe I should invite myself over soon. I need a good dose of fun. I really love coming to visit your site... you are funny and I relate to your stories! ;) I live with a short blond boy who talks to his tiger... and I really really love him esp. when he talks to his tiger!! I love George Washington and JJ. So cute. I think he looks a lot like Adrian. Was this a homeschool project? He is adorable. Too funny. Oh so cute. Please write about stenciling letters on burlap! I like the sounds of that. he's currently learning about the "great space race." he's trying to take me to the moon. I just spent the last twenty minutes reading your blog and let me tell you...it is a mood lifter! I enjoy my visits here so much. Your realness, you sense of humor and your honesty are downright refreshing. Thank you!